This is Panazz's unequaled work of Pan artistry. A high-class demonstration of the essence of this musical instrument- from the jazzy rendition of Bizet's semi-classical 'Carmen' to a Latin version of Kitchener's calypso 'Iron Man'. Panazz Players - Wrap It Up! 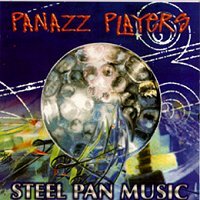 Panazz is the leading small band ensemble in Trinidad and Tobago, the islands which gave birth to the steelband. Led by their arranger, Barry Bartholomew, this exciting band has captivated audiences with their musicianship and flair for spontaneity and showmanship. There is a tremendous rapport among the players, whose technique and dynamics are absolutely superb. Indeed, solo performances by all the players betray a musicianship which reflects the talent of some of the best players in the land. Four-time winners of the prestigious Pan Ramajay competition for small bands in Trinidad and Tobago (the first time playing as Potential Symphony), Panazz is a title derived for Pan and jazz, and expresses the musical interest of these young musicians who have a flair, not only for the indigenous calypso music of the island, but especially for the jazz idiom. Internationally, Panazz has most recently participated in the BankBoston Celebrity Series at Symphony Hall in March 1997. Prior to this, Panazz performed for the United Nations in Japan in November 1996. Other performances include World Travel Market Exposition at Earl's Court, London in November 1995; the Africa in April celebrations, Memphis, TN in April 1996; and Pigeon Island, St. Lucia for the 1996 Jazz Festival. The band performs continually for several corporate organizations and other gala events. Their first album, entitled Steel Pan Music, is pan at its very best, from the jazzy rendition of Bizet's semi-classical Carmen to a Latin version of Aldwyn Roberts' calypso Iron Man, as interpreted by Ramsey Lewis and Raf Robertson respectively, two of the band's favorite musical artists. The second CD, newly released, is entitled Panazz Live, and was recorded at the band's annual concert in Trinidad at Central Bank Auditorium. It captures the spontaneity of a live performance and audience interaction. Panazz performed for TIDCO at MIDEM in Miami in September 1997, where for the first time MIDEM showcased Caribbean and Latin American music. From this performance, Panazz secured a contract and performed at Epcot Center in Disney World. The band has been described by the Barbados Advocate as "a veritable potpourri of musical gems."